Pohatu, for some reason, seemed to be the least popular of the original Toa. 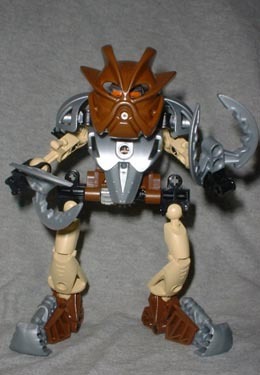 Personally, I liked his unique design and action feature, and that's why I got him as my second Bionicle. Nova has not been kind to poor Pohatu. The armor is ill fitting, the weapons aren't anything special, and the silvery colors just look bad with his brown body. 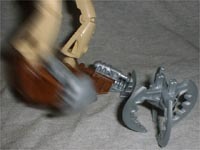 Pohatu Nuva still has a system of gears in his hip to allow him to kick with those mighty feet of his, though the set now includes extra gears and solid pieces so that you can double the mobility or hobble him entirely. The Toa Nuva have newly-designed legs that are smoother and broader than before. The new legs look especially good on Pohatu Nuva, since his power is all below the waist. Pohatu's original toe-things have been recast in the new protodermis silver (actually clear plastic with a silver pigment suspended within), but they just look out of place. He's got two big immobile claws instead of the simple 3+ rods he had before, and those claws can be combined into a pseudo "ball" for him to kick around. The ball, however, is bottom-heavy and incomplete, so the claws look better on his arms than on the ground. Pohatu Nuva is also the only Toa Nuva whose weapons don't become a means of transportation. Pohatu's torso is upside down, but he wears the protodermis armor right side up. This, coupled with the big shoulder pads, just serves to make him look more blocky than before. Fortunately, his Kakama Nuva is much bigger than (and completely unrelated, design-wise to) the original, so it helps draw attention from the rest of him. The Great Mask of Speed allows the user and those around him to move at great speed and pass through solid objects without harm. Bionicle is continuing the tradition it began last year with fun toys and an engaging story. The Toa have been updated, but Pohatu seems to've been left behind. In fact, you'd be better off with the original Pohatu than this Nova version. Do you like the Bionicles, or are you a mildly retarded? Who's your favorite? Tell us on our message board, the Loafing Lounge.